One of the most delightful aesthetic expressions of the eighteenth century is the glass made in the royal factory at La Granja. It is unique in the long history of glass-making in Spain. It owed its existence almost entirely to the protective zeal of sovereigns imbued with the tastes and culture prevailing in France and Italy. It had no connection whatever with other glass made in the Peninsular, nor was any effort made to adopt the methods and designs of the La Granja factory in other parts of the country. The feminine delicacy, the refinement and grace which the art expressed were uncongenial to the vigorous, essentially masculine artistic conceptions inherent to Spaniards. It never really became identified with the Spanish genius, though in the hands of Spanish artists it underwent certain modifications, the outcome of their pronounced individualistic temperament. It became less exquisite, in character more robust; the designs were richer and more exuberant; but it provided too little scope for the spontaneity, the energy and the naturalism which Spanish art seeks to express. The La Granja factory was the immediate outcome of a special need created by the innovations in taste in the eighteenth century. The coming of the French Bourbons to the throne of Spain opened the sluice gates to the flood of new ideas in art and decoration which had pre­viously been trickling into the country. Houses were now built with big windows and glass doors; salons were decorated with mirrors; glass ornaments and table appointments came into vogue; coaches and chairs were provided with large plate-glass win­dows; in short, glass was much in demand, and means of obtaining it had to be devised. King Philip V. built for himself a magnificent palace at La Granja de San Ildefonso, a wild, remote place in the beautiful country on the northern slopes of the Guadarrama. Richard Twiss, who visited it some years later, describes the "vast herds of deer, many hares and very numer­ous coveys of partridges which live here in per­fect security." In con­trast to these surround­ings, the palace itself was a focus of the artistic activities of that sophisticated age. "All the rooms have their ceilings painted in fresco," the same traveller tells us, " and are decorated with large looking-glasses made here .... The windows, which reach from the ceiling to the floor, consist of large plates of glass set in lead gilt." 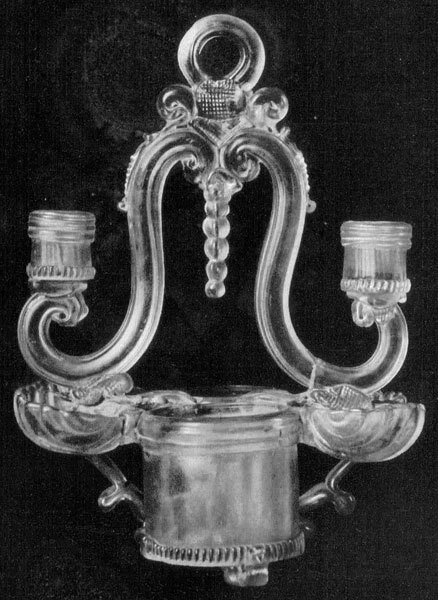 The glass works which Twiss refers to were set up under the patronage of Philip V. in 1728 by a Catalan, Ventura Sit, an artist of skill and experience. Finding at La Granja the materials for his work ready to hand, both in the quality and abundance of the sand in the vicinity and in the fine supply of fuel offered by the extensive pinewoods all round, he set up a furnace for the manufacture of plate glass on the borders of the royal demesne. The enterprise met with suc­cess, and after some years the work was brought to the notice of the Queen, Isabel Farnese, who was herself actively engaged in extending the spacious avenues and pleasure grounds, and adorning them with fountains of sur­passing ingenuity and imaginative beauty. She it was who had a factory built for the glass workers within the royal grounds and per­sonally encouraged the extension of their acti­vities. The output now be­came more artistic. Mirrors for the adorn­ment of the Palace were made in great quantity. Some of them were of immense size. " I saw glasses of one hundred and twenty French inches by seventy-two," writes Richard Twiss, "which are the largest that have ever been made." Smaller mir­rors were very finely engraved and framed either in gilt or ebony.. Examples of these may be seen in Nos. i. and ii. The chandeliers, which date from this epoch are of great beauty, showing as they do imagination and inventiveness in devices for the reflection of light. They vary in size, some being made to hold four lights, others as many as sixteen. Drinking ves­sels were also manufactured and decorated with rich designs cut deep in their surface (No. VIII.). The greater part of the output was destined for the King, and used by him for the decoration of his palaces or as gifts which he presented to other sovereigns or to his friends. It was not, however, till after 1771 that the finest pieces of La Granja glass were produced. In that year a new and extensive factory was set up by Charles III., that most munificent and energetic patron of Spanish art, founder of the great factory of Buen Retiro, initiator of the finest buildings in the capital and its surroundings. The new premises were magnificently planned, with numbers of ovens and adequate accommo­dation for the various artists and their assistants engaged in the manipulation and decoration of the pieces. The output was plentiful and varied. Long-necked decanters, flagons, beakers, tumblers, vases with two handles, covered bowls, made up a large part of the production. First class engravers were brought from abroad. Eder came from Sweden, and Sivert from France to direct the work of decoration. Designs consisting chiefly of garlands of foliage, floral knots, buds and rosettes were cut and frequently covered with gilding. In some cases the designs are merely laid on in gilt, in others the gilding is painted over in various colours, pink, white, blue, and red. Bottles, flattened on four sides and painted, were made constantly. They resemble those made in Germany for liqueur stands, but they were usually smaller and were intended to hold perfume and toilet water. Very beautiful candlesticks and table ornaments were produced, some delicately engraved. others owing their beauty to the cunning manipulation of the glass itself. An example of this may be seen in No. vi., where pink is introduced into the foliage and the chain and pendants are light and delicate, and brilliantly transparent. The centrepiece, in No. IV., is engraved in a light graceful design, while the winding of the glass strands in the middle is done with a pleasing delicacy and precision. A large quantity of white opaque glass was produced by the addition of phosphorus to the mixture. This was chiefly made into goblets and beakers, which were frequently decorated with brilliant floral designs of red, blue and yellow. Opaque glass was also produced in different shades of blue, both dark blue and saxe blue. Some of the mugs made from it are flattened and decorated with filigree tracery. On another page of this issue are illustrated two covered bowls, gilded and painted in red and blue, which form part of a complete set which was made for the dispensary of the Royal Palace. On the covers is a garland of green leaves bound with blue and white ribbon (see illustration in Current Art Notes). No. VII.- (Left) Tumbler, with pink and white filigree tracery. (Centre) Engraved tumbler. (Right) White opaque glass mug, with gilt decoration in the Osma collection. "Glass manufacture is here carried to a degree of perfection unknown in England .... Yet even for such purposes it [the factory] is ill placed and proves a devouring monster in a country where provisions are dear, fuel scarce, and carriage expensive." In spite of the lack of profits, however, the influence of the factory was beneficial not only for the contribution, essentially beautiful and interesting, which it made to the art of the country, but also on account of the employment and encouragement which it extended to Spanish artists and artisans. Swinburne, in his travels through Spain in 1775 and 1776, wrote the following account of the works : "I am told that the King makes no profit by it. However, it is a very material point to be able to supply his subjects with a good commodity, and to keep in the country a large sum of money that heretofore went out annually to purchase it from strangers. They also make bottles and drinking glasses and are now busy erecting very spacious new furnaces to enlarge the works." 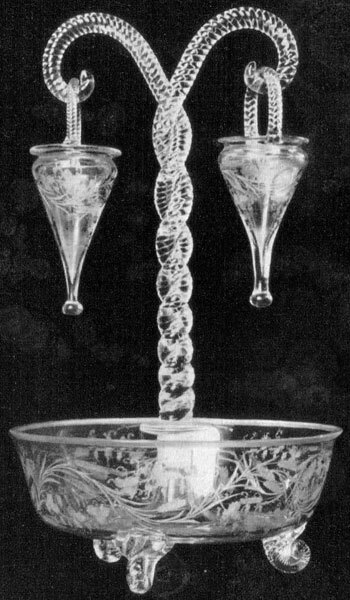 The quality of the glass continued to improve, and in the early years of the nineteenth century a clear white transparency was achieved without any trace of the greenish tinge which may be noted in early specimens. It was introduced into Mexico, where it was made with marked success in the town of Puebla, and it is to be found all over the country to-day. In 1828, the factory passed out of the possession of the Crown into private hands, and some years later it was closed down owing to lack of funds to maintain it. In recent years the furnaces have started once more, and plate glass of good quality is blown there.